When the Caron Cakes first hit the stores back in August, I put together of project ideas that I thought would look great with this fabulous yarn. You can see the original list HERE. Since then, crocheters have come up with really great patterns and ideas for using this yarn. Now that it is just about time for the Caron Cakes to have their second release and the stores will be restocked soon, check out this project ideas to inspire you before you buy. Open-Air Market Scarf – a pretty triangle scarf. Blue Ridge Wrap – a lovely asymmetrical shawl with a zig zag edge. Ring Around the Rosie Vest – so adorable for the little girls. Dragonfly Poncho – 1 cake for a child size and 3 for an adult. Gemstone Lace Shawl – a very lovely design that really accents the yarn nicely. Gemstone Lace Poncho – same design but poncho style instead of open shawl. Crochet Cast Sling – well, hopefully no one really needs this, but what a great idea! Amelia Poncho – for sizes 24 months to 2T-3T. Happy Go Lucky Shawlette – this is so fun done in Rainbow Sprinkles. Basket Weave Cowl – this is on my to-do list as I do love wearing cowls.. Autumn Chill Scarf – another lovely 1 cake project. Lilac Frosting Scarf – looks super easy, but with a nice texture. Chunky Cowl – this is a paid pattern, but so pretty I really wanted to include it. Autumn Chill Angled Super Scarf – so hot and trendy for fall. Desert Winds Triangle Scarf – looks like a great one evening project. V-Stitch Prayer Shawl – simply gorgeous! Veekender Shawl – so lovely in Faerie Cake. Alpine Nights Beanie – includes a link for a matching super scarf. 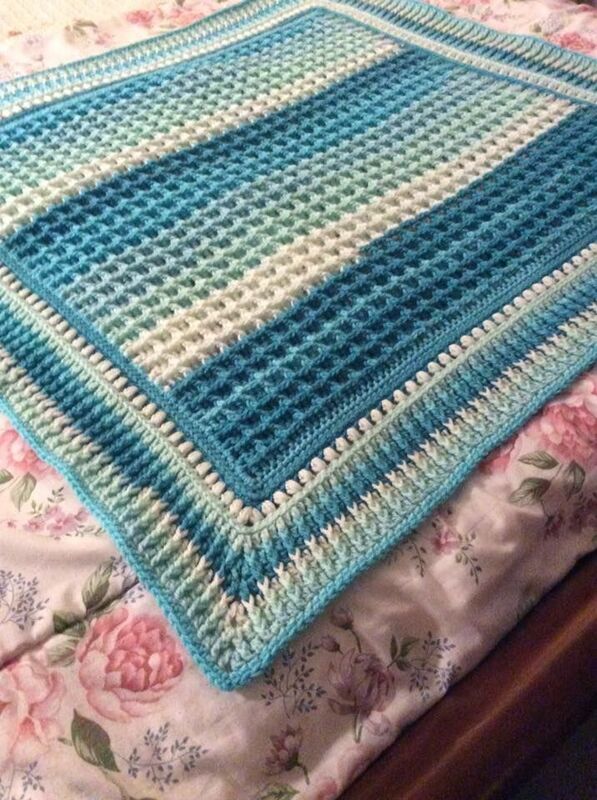 Waffle Stitch Blanket – I’m so sorry that I could not find a pattern for this, but it’s so inspirational. If someone knows who made it, please let know to update the link. **Update, the designer has reached out. It is a paid pattern on Ravelry and you can find the link HERE.